Imagine a city built not only around, but inside the shell of a 2000-year old Roman emperor's palace. Throw in a mountain backdrop and coastal setting lapped by the sparkling blue waters of the Adriatic Sea. Not a fantasy: this is Split, Croatia. Our guide Robert joins us today to tell us about a side of Split not often written about in the tourism brochures. And he should know! As the publisher of the English tourist newspaper «Discover Split», Robert is always aware of what visitors to Split already know...and what remains a local secret. Living here for the past seven years, we never get tired of being surrounded by so much fascinating history—I mean how many people can say they walk in the footsteps of a famous Roman emperor every day?! But like all marvelous places, there's always another side. 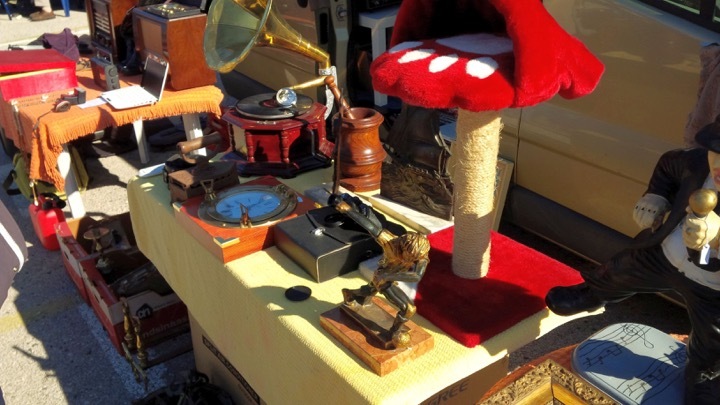 And for my wife Natasha and I, it's waiting for Sunday to join hundreds of locals at a huge open air flea market just outside the city where we happily spend hours sifting through some pretty fabulous stuff. For years there used to be an impromptu weekend flea market just outside the Palace walls in the street above Split's bustling Green Market, but last year it was closed down, since replaced with only a handful of sellers showing their wares on the stone tables near the flower sellers. So when a friend who lives in Brda (a tight-knit ethnic Split neighborhood full of impossibly narrow streets with houses of every stripe chock a block from barely functioning to gorgeous; each with amazing gardens and grape arbors) told me about the sunday market in a huge open lot just behind the Nirs Hotel /Retail store in Solin, on Dracevac St., we were there. And not just us: there was a steady stream of cars all happy to pay 5 kuna (about 80 cents) to park close to the action--for those who don't want to pay, you can park for free and walk about half a klick. The actual "entrance" to the large open lot itself is free. What's wonderful about places like this is the sheer diversity of stuff people collect and sell and the immense pleasure that comes from discovering their treasures as well as their trash. And it's all Croatian. Last time I was there, for example, there was a guy from Zadar with a truck full of amazing old wooden trunks, carved stone olive oil vessels, huge gas-fired lamps (probably lit some factory decades ago), buckets of terrific antique hand cut nails and more.....Behind him, all on the same table, the perfect cat house/scratching post for our 7 kilo beast next to a mint condition old Victrola with its shiny brass horn. Around the fringes there are quickie cafes with outdoor tables serving up home cooked sausages, fritule (Croatian donut holes but better) and other goodies. As you enter, a slew of sellers hawking fresh picked mandarins and sensational Fuji apples trucked in from farms 100km away--the Fuji's were 20kn for 4 kilos. A bargain! In the Green Market, not as fresh, 10kn a kilo! In addition to produce, food, clothes, hand tools, bicycles, old military uniforms, hand-forged wrought iron tools there's even a guy who does nothing but take your windshield wiper and put in new rubber (his collection is impressive, so no matter how strange your wipers are, this dude has a replacement). But the most surprising "item" sold here is cars--twenty or more, plus scooters, cycles and we hear even a big semi if you want! The big ticket item was a gorgeous Mercedes for 25,000E whose retail value was close to 40,000E. What a great place to poke around for an hour or two. Even if you don't buy a single thing, there's just something about seeing so much stuff all in one place and maybe or maybe not, picking up a bargain. Our strangest experience? Checking out a really handsome, large aluminum water pitcher or maybe milk jug, with a brass handle and lovely slender spout. It had a certain style that would make any bouquet of flowers look terrific. I picked it up and tried to make out the markings and holy cow was that a double eagle mark with a cross under it....uh oh....no....it was more. So I asked the seller to verify my awful realization and cheerfully she said, "Yes, you're right, this is a WW2 German kitchenware water holder, with the SS mark." OK, thank you, pass.....quick, Natasha, give me one of those Fuji apples to wash the taste out of my brain...even now can't stop thinking, what if I didn't look at it more closely and brought it home?! Another exciting day in always surprising Split---hey, maybe we should make this a TBL Tour?! Coming to Croatia? Don't miss Split! Whether your interests are antique markets or (living) Roman ruins, Robert can show you the best of this exuberant Dalmatian city.